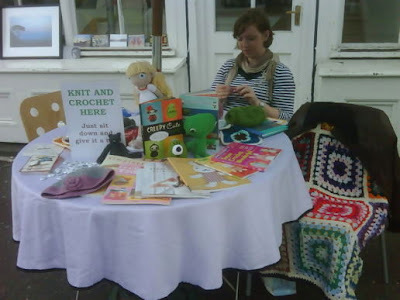 The lovely Noisy Pitta and I had a great day back in June teaching the good people of Crystal Palace how to crochet. Here's Noisy Pitta Alison herself sitting at our stall, surrounded by brightly crocheted objects after driving 2 hours just to come and sit next to a person she met on the internet. Surely she deserves some sort of medal or award?! The day, aimed at promoting the local shops in the area, was organised by the It's A Green Thing people, who confused me recently when they decided to move their shop to the other side of the Triangle. Lots of people stopped by to learn, which was a pleasant surprise - I had visions of us spending a day sitting on our own while people gave us a wide berth. Teaching is tiring business (as Vanessa will attest), so thank goodness for whoever brought over the Eton Mess for us to devour, and for fellow professional blog botherer and Crystal Palace dweller, Rob, who bought me a pork butty from the food market. Otherwise I may well have *died*. All in all a good time was had by all, and hopefully a few people will have found the lessons helpful! it sounds like and looks like you guys had fun! Now THAT'S what I'm talkin about! I've been messing around trying to get an International Crochet Day going for the very purpose of educating the public at large about crochet and here you are doing it. I hope you enter my blog contest to win a handmade hook because you certainly qualify with what you're doing! I just wanted to pop in and let you know that I love your little hats, they're so super cute, and congratulations on teaching so many people to crochet! By the way, what's a pork butty? A pork butty is British slang for a pork sandwich!